At least nine Israelis have reportedly been wounded in a stabbing attack on a Tel Aviv bus on Wednesday morning. The assailant was shot by Israeli police, local media reported. 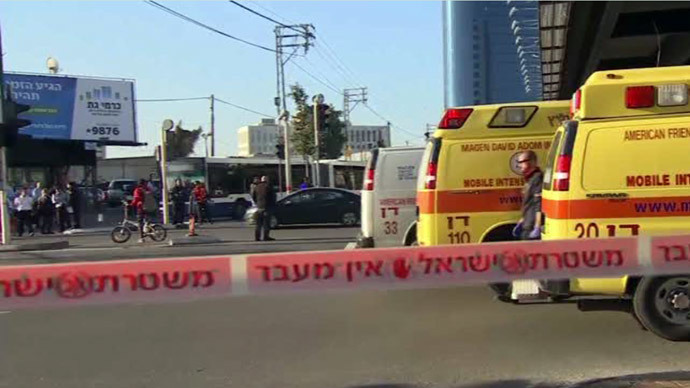 At least nine people were stabbed by a passenger on a Dan Line 40 bus on Begin Road in Tel Aviv near the Maariv Bridge, according to Haaretz. Three of the victims are in serious condition. The driver was the first victim of the attacker, so he was unable to open the doors of the bus, which was full during the rush hour, according to an eye-witness report. It was one of the passengers who managed to open the doors and let the frightened people out, i24news TV-channel reported. The police chased the offender and shot him, hitting him in the leg, near the scene, on Hamasger Street. The arrested attacker was a 23 year-old Palestinian from the West Bank city of Tulkarem, who entered Israel illegally several days ago. The attacker was identified as Hamza Muhammad Hasan Matrouk, the Shin Bet Israel Security Agency said. He has been questioned and has admitted to carrying out the attack. He said it was motivated by Israel’s Protective Edge operation last summer, the religious tension at Jerusalem’s Temple Mount, and extremist Islamist television programs, according to the Jerusalem Post. Police are investigating the attack, and the area has been closed to traffic. A police spokesperson said there had been no advance warning or threats of a terror attack in Tel Aviv, according to the i24news TV-channel. 5 people injured moderate/seriously and further 4 injured lightly. Police security patrolling tel aviv area to prevent any further attack. Medics say the people were severely wounded especially in their upper bodies, chest, back and neck. Those who managed to run were severely wounded, collapsed a few meters after escaping the bus. A member of Hamas' political bureau, Izzat al-Risheq said, “The attack carried out this morning is a bold, heroic act and a natural response to the crimes of the occupation and terrorism against the Palestinian people,” Haaretz reported. Last November, a 25 year-old Israeli woman was stabbed to death at a bus stop in the West Bank, local media reported. The perpetrator was shot and died from his injuries. There were two other victims in that attack, who were taken to hospital. On November 10, a young Israeli Defense Forces soldier was stabbed by a Palestinian at Haganah train station in Tel Aviv. He was taken to hospital, where he died of his wounds. In another November incident, a 3-month-old baby girl was killed and eight people were injured, when a car crashed into a light railway station in Jerusalem in a “run-over terror attack”. According to the police, the car’s driver was shot and killed while trying to escape.